Sometimes the most basic steps in completing a successful concrete pour are overlooked or minimized. When your goal is a floor with vibrant color, a polished slab that draws the eye or even a perfectly finished sidewalk, floating is one of those steps that get you to that point. Floating has to be done on virtually every concrete job after concrete is poured and leveled. (Leveling is usually accomplished with a screed.) Done properly, floating pushes the aggregate down into the concrete and encourages moisture to rise, helping the concrete dry and creating a smoother surface. This is really the first step in the finishing process, and it requires a deft touch and the right tool. "Some floats seal the concrete while others tend to liven it up," says Mike Schirmer, president of Czar Weld Tools. "If you're adding color, for instance, you want concrete that's receptive to receiving the color. As a general rule mag (magnesium) and aluminum floats tend to seal, while wood and resin floats tend to open or bring more paste to the surface of concrete." There are floats available for virtually any application, big or small. Bull floats and screed floats are designed for large flatwork jobs, while hand floats are generally used for smaller jobs and touching up the edges and hard-to-reach areas of large pours. Bull floats allow the operator to reach far out onto a slab without having to get on the concrete with knee boards. 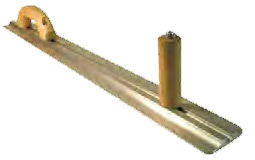 Bull floats consist of a long handle attached to a wood, resin, aluminum or magnesium float. The handle can measure anywhere from 4 feet to 16 feet long. Handles either snap onto the float or are threaded on. A bracket assembly allows the angle to be adjusted to different positions so that the float can reach the concrete surface at the angle needed for the job. The floats are available in many different lengths and widths. They are designed with square or rounded edges and the choice of which to use is usually a function of user preference. Screed floats are designed as a two-in-one application for large concrete pours. Screed floats typically feature a float attached to a motor with handles. Attachments are offered in a variety of sizes and materials. Magnesium options offer a way to essentially screed and float in one step - as the concrete is placed, the operator pulls the float along the surface of the material (screeding) and the magnesium blade leaves a smooth (floated) surface. "The mag float is the staple of the industry," says Trish Redus, sales manager with Goldblatt Tool Co. LLC. A mag float is simply a flat piece of magnesium or aluminum attached to a handle. 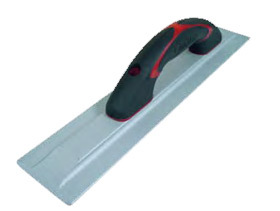 The tool allows the user to float concrete at his or her desired pressure and angle. Mag floats are available in a wide range of lengths and widths. Handles are increasingly being designed with user comfort in mind - a variety of options are available in regard to handle shape, size, and hardness or softness. Manufacturers also offer an assortment of handle positions on floats (with the handle attached farther forward or back on the float). Every concrete contractor should have a wood float in his or her toolbox. Wood floats are made of hardwood (mahogany or teak, for example) to resist wear and warping. 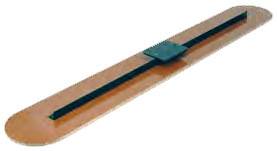 Like mag floats, wood floats are available in an assortment of widths and lengths with a variety of handles of various designs attached in any number of places. Wood floats are particularly useful in those stressful instances in which concrete is setting up too quickly. Wood floats rough up the surface of concrete more than does magnesium, almost forcing moisture to the surface while opening the surface up (or increasing porosity) for surface applications of color, hardener, etc. Resin floats were designed as a more resilient and wear-resistant alternative to wood floats. Resin floats perform virtually the same as wood floats, i.e., roughing the surface more than magnesium, drawing additional moisture to the surface, and opening up the concrete for surface applications. While some contractors continue to prefer wood floats, the choice between wood and resin seems to be a matter of taste. Hand darbies are much like mag, wood, or resin floats, except they are longer, often tapered (wider at the tail end, narrower at the head) and they feature either two handles or a handle and a dowel, allowing the operator to utilize both hands. With a darby, the user can extend his or her reach onto the concrete surface and can also apply more pressure when needed (for instance, when concrete is setting too quickly or in applications that call for a stiff slump). Some darbies feature fixed handles, while others have adjustable handles. Kraft Tool Co.'s Laminated Canvas-Resin Hand Float is a particularly good choice for decorative concrete applications. Blade has rounded corners to reduce float marks. Face is sanded and broken in for just the right feel for finishers. The float's 3/8-inch-thick canvas resin material is long-wearing and does not seal the surface, which aids the decorative coloring process. Heavy-gauge C channel keeps the float rigid for even wear. Fitted with the exclusive EZY-Tilt II adjustable bracket. Marshalltown offers a wide range of magnesium bull floats, all made of extruded magnesium and available in a variety of widths and lengths. Made from the finest extruded magnesium available. Lightweight, long-wearing and properly balanced. Marshalltown offers wood bull floats in three lengths: 36 inches, 48 inches and 60 inches. Each of the three are made of laminated poplar. Tapered from 1 1/4 inches thick at the center to 11/16-inch thick at the ends. Used to open pores in setting concrete and to draw any excess water to the surface. Come with complete bracket assembly. Marshalltown offers an array of resin bull floats, each of which work the slab like a wood float but last many times longer. Great for working color hardeners into concrete. Six-hole mounting plate fits wide variety of mounting configurations. Has an angle steel backbone for decreased blade twist. Broken-in, beveled edges on ends of work surface. Available with square or rounded edges. Wagman Metal Products offers a couple of options when it comes to bull floating - their more traditional bull float and their narrower speed float. Both are made from a high-strength recyclable aluminum alloy with better wear resistance than magnesium. T-slot adds strength and allows for attaching virtually any bracket, with no hole threads to strip. Angled ends help reduce lap lines. High side walls on the leading and trailing edges stiffen the float to avoid warping and twisting. They also act as screed walls for cutting and filling. Available with traditional rounded corners or with unique square edges. Weights securely bolted on easily. Versatile groover accessory can be easily attached to make rough cuts. Straightening rods and outriggers can be attached. A faster and easier float to use, as it is narrower and creates less fiction than a bull float. T-Slot allows for attaching virtually any bracket, with no hole threads to strip. At 5 inches wide, it is ideal for exposed aggregate. Great choice for following vibratory screed to knock down lap lines. Available with rounded or square ends. 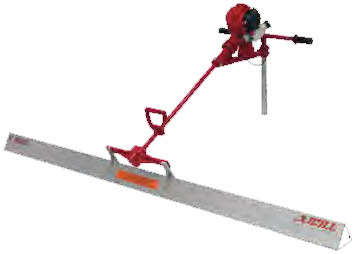 Featuring seven interchangeable magnesium blades ranging from 4 feet to 16 feet in length, this vibrating screed leaves a smooth, fine finish that can be left as is or serve as one step in a finishing operation. Ergonomic, extendable handles (no keys required). No visible cables in the handles. Stone Construction Equipment Inc. offers a hand-held vibrating power screed line - the Stone Screed Bull line. Featuring Stone's patented extruded aluminum screed boards, the Screed Bull offers contractors the opportunity to screed and float concrete in one step. Choose from two models - the VSB80 professional contractor's model, which handles boards of up to 16 feet yet weighs only 32 pounds, or the lighter-weight rental-ready VSB70, which handles boards of up to 12 feet and weighs only 25 pounds. Powered by four-cycle Honda GX25 engines, both models utilize Stone's patented extruded aluminum screed boards with equilateral triangle geometry. The blades will not bend, twist or warp. The perfect matching of the power unit and boards allow these screeds to work with most slumps. A handle-mounted throttle for fingertip control of vibration. Operator comfort from an adjustable handle. Operators can work standing up. Cast aluminum frame for longer life and a lighter operating weight. Easy removal of the power head from the boards to switch board lengths. 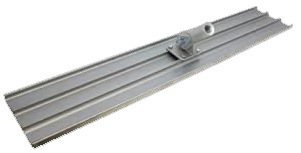 Screed boards are available in lengths from 4 feet to 16 feet. 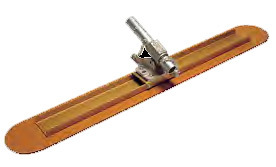 Two-foot extensions can be added to each end of the boards to extend or make custom lengths. Extension straps are also available to connect two power units and boards together to cover larger pours with the same efficiency. Goldblatt PRO Grip Magnesium Concrete Floats are made from high-grade magnesium with the "pre-broken-in" design that their finishing tools are known for. PRO Grip mag floats are available in three blade styles. The handles, designed in conjunction with a panel of professional finishers, are ergonomically shaped. All of the signature series PRO Grip tools carry Goldblatt's lifetime guarantee. The 3/8-inch thick canvas resin material is long-wearing and does not seal the concrete surface, which aids the decorative coloring process. Kraft also offers many mag and wood (redwood and teak) floats. 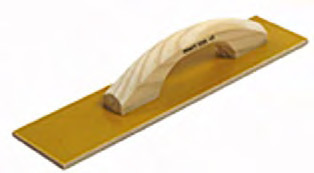 Marshalltown offers a variety of hand floats made from magnesium, wood or resin. Cast from the finest magnesium. Designed with just the right broken-in shape. Cast construction allows more knuckle clearance. Placement of handle gives the float perfect balance. Available with wood, Dura-Soft or structural foam handles. Made from clear 3/4-inch-thick seasoned redwood or Jarrah hardwood, which is harder than teak. 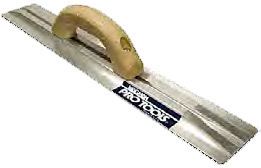 Primarily used for leveling and smoothing concrete prior to final finish. Also ideal when slightly rougher concrete is desired. Available with wood or Dura-Soft handles. Made from 3/8-inch-thick laminated canvas resin. Extremely dense. Works the slab like a wood float but lasts longer. Available with square or rounded ends. Wood or Dura-Soft handles available. Wagman offers magnesium and cast aluminum hand floats featuring their T-slot design. The T-slot design allows operators to attach a variety of handles in an assortment of positions according to the comfort of the user and the demands of the job. T-slot design allows various handles and positions. Available in recyclable aluminum alloy or magnesium. Strong center rib adds durability. Made from recyclable aluminum alloy. Long handle attaches for hard to reach places. Width of 5 inches is ideal for decorative applications. Wagman also offers wood and resin hand floats. Works like wood, wears like steel. Made from the finest selected mahogany. Wagman offers darby floats for virtually any application. Most feature their T-slot design for various handles and positions and a strong center rib for added strength. 3 1/8-inch-wide aluminum with one float handle and one dowel. Stronger than common magnesium hand darbies. Engineered for rugged performance to withstand heavy pounding with low-slump or stiff mixes. T-slot center rib allows infinite handle settings. Any number of handles can be added using 1/4-inch hardware. 3 1/8-inch-wide aluminum with two float handles. Becomes swing darby with simple modification. Made from the finest ribbon- tapered-grain select mahogany. Double contoured grip-loop handles for extra comfort.